To kick off the ‘Meeting my characters’ series, I present to you a character near and dear to my heart; my main on WoW, Mishaweha. Mishaweha will heal you with this large spikey mace! (Boy, doesn’t that name sound familiar). She doesn’t ‘live’ on an RP server though, so I don’t spend too much time fleshing out her personality and history. However, I did get the opportunity to bring her into a Gaiaonline RP at one point, so the base of this ‘Meet’ form was filled out from the Gaiaonline RP application. I’ve made a large number of changes and additions, to fill out sections I didn’t have on the Gaiaonline app, and to add/subtract details to fit her more in how she is in game. Name: Mishaweha; Misha for short. (This is merely a public name, used for contact with people outside of her tribe. Her private name is, well, private). 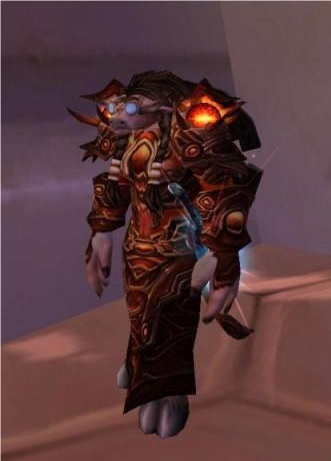 Appearance: Tauren, known in some vernaculars as ‘cow-people’, look pretty much like they are described (humanoid cows); tall, standing on two hooved legs, with tail, horns, ears, and a muzzle similar to those of cows. She stands tall at 7’6”, an average size and build, though she appears more muscular and sturdy than those who do not travel for a living. Her fur is a golden tan, with large patches of creamy-white fur all over. She has a dark brown mane that goes from the top of her head to slightly past her shoulders, with two thick braids hanging in front, down to her stomach. Above her blue-green eyes are her horns, somewhat long for a female, their color going from light brown to dark brown at the tips. Slightly below her horns are her ears; she can be quite expressive between them and her tail. Mishaweha often makes her own clothing; she is a fairly decent leatherworker. Her more casual clothes usually are a mix of leather and cloth (some looking more tribal than others). However, she is typically seen in either her traveling attire (mostly thick leather) or battle armor (mostly chain mail). 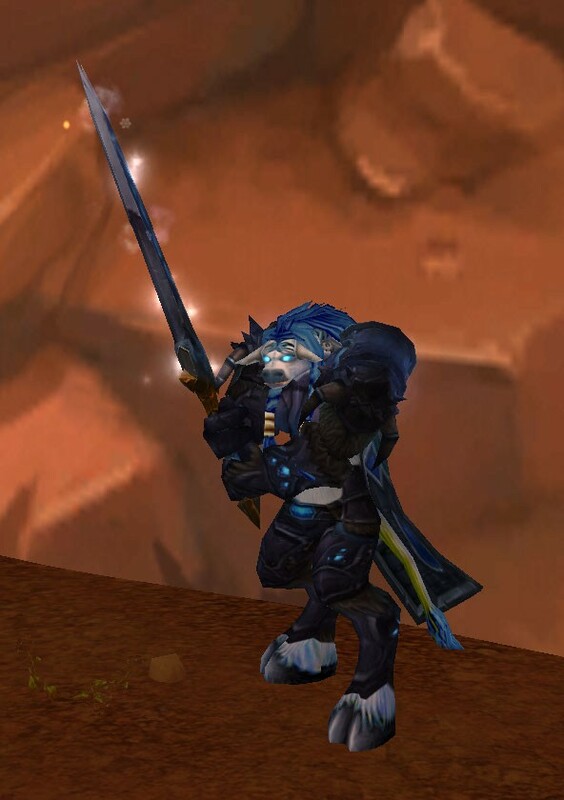 Both her traveling and battle armor do consist of a chest guard, shoulder pads, cloak, and helm (her more ceremonial helm is one that was a former wolf’s head). She uses a mace and shield as her weapons. She also carries a satchel, strapped around her back, to carry food, water, and extra gear when not fighting. 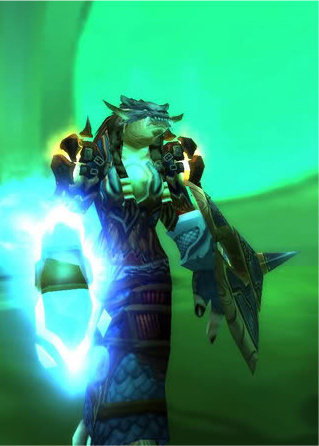 Home: She was born somewhere in the plains of the Barrens, but now resides in Thunder Bluff. 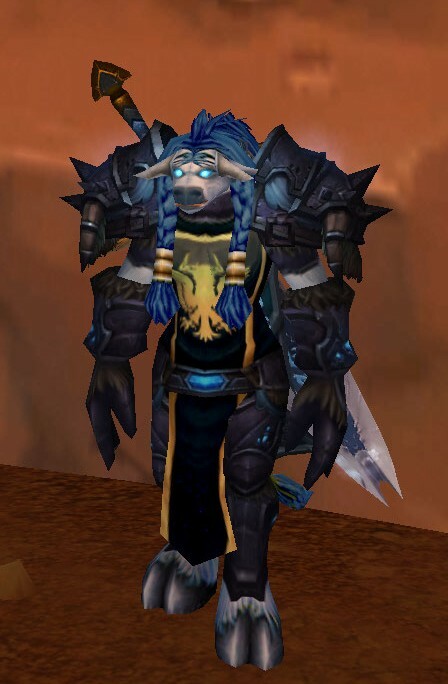 History: Mishaweha was born before the founding of the Tauren’s capitol city, and therefore spent much of her childhood roaming the plains of the Barrens with her tribe. It was a dangerous time, with much turmoil caused by Centaur, Quilboar, and other enemies of the Tauren. However, Mishaweha’s tribe persevered, due to it’s larger size, and willingness to travel with other Taurens tribes for safety. While in the tribe, Mishaweha lived with her blood relatives, in their own tent; her parents, her grandparents, one of her aunts and her children, and her two younger sisters. It was a little crowded, but Misha didn’t mind. Mostly because she was out of their home often, due to her shaman training. (Earlier in her childhood the elders of the tribe recognized that Mishaweha had a connection with the spirits, and therefore was chosen to become a shaman of the tribe, a lifelong commitment with years of study involved; in act, it was only a few years ago that she completed the final tests needed to become an official shaman, instead of just a pupil). While her training started off with more general lessons, it wasn’t long before the focus switched to the nurturing side of the Earthmother, due to her proficiencies with healing (though she still did well with direct elemental manipulation). 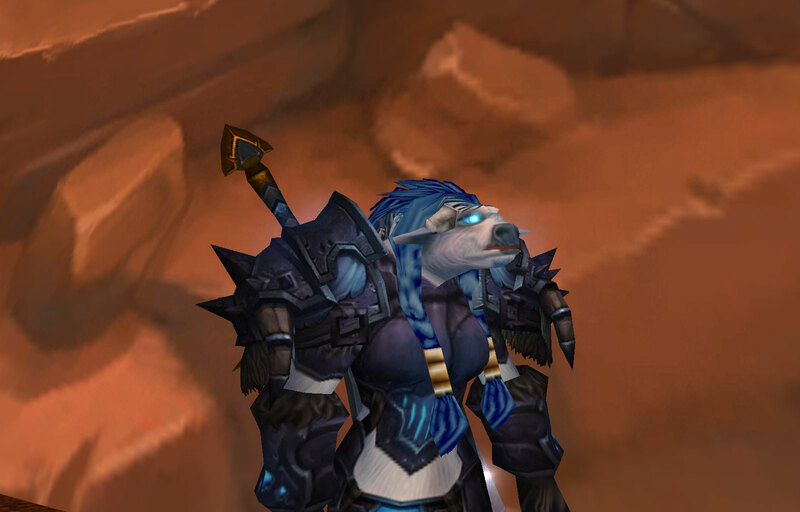 And so her life continued in such a fashion – doing various chores for the tribe with the other young Tauren, and continuing her shamanistic studies – until the Orcs arrived. Since the Orcs had already contacted other well-respected tribes, it was an easy decision for the elders of Misha’s tribe to decide to join them. The Orcs would help them drive the centaur from the lands, including the Tauren’s ancestral home of Mulgore. 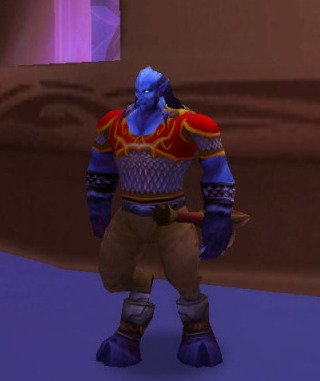 In return, the Tauren would help the Orcs settle in other parts of the land. 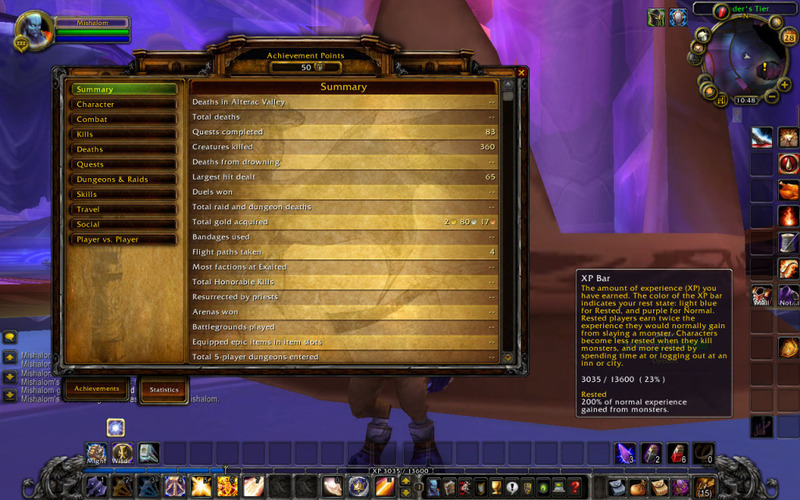 This sat well with many Tauren, who were unable to muster the sheer numbers needed to take back their homelands. Mishaweha, while technically an adult of her tribe when the Orcs came, could not participate directly in any battles away from the tribe, as her training required her to stay with the elders. However, she vividly remembers the time the ‘green skins’ came. How their tribe merged with other tribes, with the Orcs, and with the Trolls, another ally of the Orcs. How preparations were made for the additional company, and for wars. How weapons were made anew; how old ones were honed once again to deadly points. How cloth was scavenged or woven carefully from fibers, to turn into clothes and bandages. How hunts seemed to happen day and night for more meat for the large population. How leather was formed into battle armor, or stretched to make new homes for the newcomers, who had no place of their own. It felt magical, unbelievable. The tribes had rarely spent such a long time in one another’s company, as it was easier for follow kodo herds in smaller groups. But now there were many joining forces together, and they had much to teach one another, between tribes, and between races. But it did not stay so magical for long. Braves would leave the encampment for battle and not return alive. Injuries left others permanently at their homes, unable to fight any longer. And it was a tiring for those who did not have to charge into battle, with the injured to take care of, and more and more duties being assigned to them to keep their warriors fed. Misha, even though she rarely fought during the wars, also felt the strain, from her continuous lessons, and the extra work that needed to be done around the tribe (such as using her skills to make and repair armor, or prepare more bandages). Eventually, the Orcs, Trolls, and Tauren persevered, driving the centaur and their other enemies from the land, from one end of the coast to the other. While they all settled in separate areas of the land, the Tauren tribes pledged to remain allies with the Orcs and Trolls, as it was with their strength and numbers that Tauren could once again claim Mulgore as their home. One of Misha's adventuring outifts. There was still some difficultly, however, when it came time to decide what to do with their homeland. From what Mishaweha could gather from the elders’ conversations during her lessons, the various tribes had disagreements on where to settle, or even if they were going to permanently settle. It had been several generations since the Tauren had made permanent structures to call home; some weren’t sure if they would wish to settle. The Bloodhoofs, a well-respected tribe and the defacto spokesperson for their people with the outsiders, listened to all of the tribes differing opinions. The end decision was that they would make the majority of their settlements in Mulgore, that all tribes could live in or make use of, but if a tribe did not want to live in their cities, than they were not required. This decision sat well with most tribes, though some tribes rejected the idea of ‘open’ settlements (in those cases, they often made a settlement elsewhere in Kalimdor, or continued to be a wandering tribe). Mishaweha’s tribe conferred amongst themselves, before they decided to join the Bloodhoofs and many other clans to build a city. After surveying the land, the tribes collectively choose the Thunder Bluff as the site of their new city (a few other places along the way were determined to be good for smaller villages, but were not as defensible as the high bluffs could be). Misha participated in the construction of this new city, her skills with leather coming in handy to help make the roofs and walls of some of the buildings there. It was not long after construction of Thunder Bluff was complete that Misha went through her rite of passage to become a fully recognized shaman (it involved lots of traveling and dealing with various elements; Misha does not speak of it very much at all). Once she was granted the honors of being an official shaman of the tribe, she technically became an elder of her tribe, privy to council meetings and other important decision making. However, most of the elders were more experienced than her (aka they were actually elderly), and therefore Mishaweha’s opinions were generally ignored by the circle. Feeling somewhat frustrated for the apparent lack of difference she made in her tribe after all her years of work, Mishaweha went off to adventure (there is a word for this in Tarahe, meaning something to the effect of “Life-journey”, or perhaps “sabbatical”. 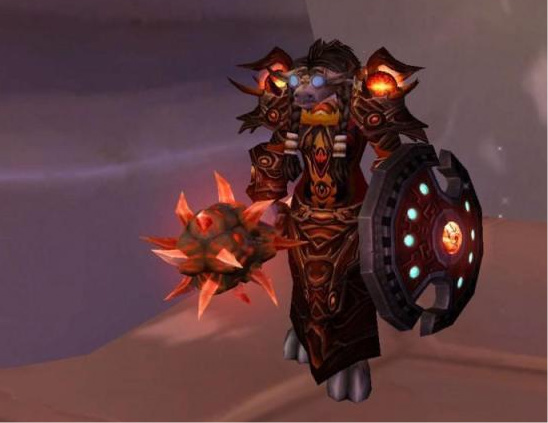 It used to mean a time shortly after one became an adult in the tribe, where the Tauren would go off to assist other tribes, or go on a spiritual journey alone. It would usually last a few years, depending on where they what they decided to do, and is considered something typical for a young adult to do to further strengthen themselves. With the arrival of the Orcs and Trolls, it then became in vogue to send these adventuring adults to assist their allies, instead of just other wandering tribes). To this day, Mishaweha is still adventuring; with most of her tribe living in Thunder Bluff, she can easily visit them, making it easy for her to adventure in the world. During her travels she has strengthened her abilities to work with the elemental spirits, and has met a rather… interesting group of people with whom she works with often. Yes, it’s true; I actually don’t know what Misha’s proper tribe name is. 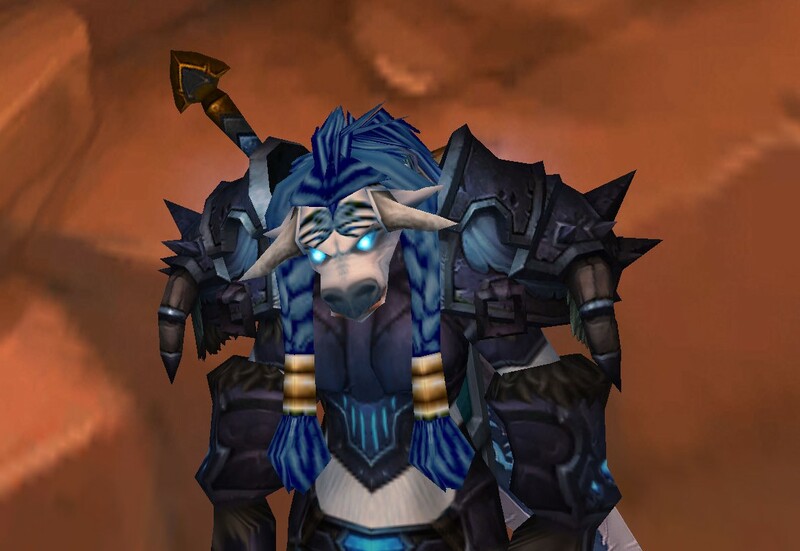 I tried tacking on various Tauren-sounding names onto Mishaweha, like Plainstrider or Skyweaver, etc., but none of those really fit. So I leave her name as a mystery wrapped in an enigma. Her age is also of question. 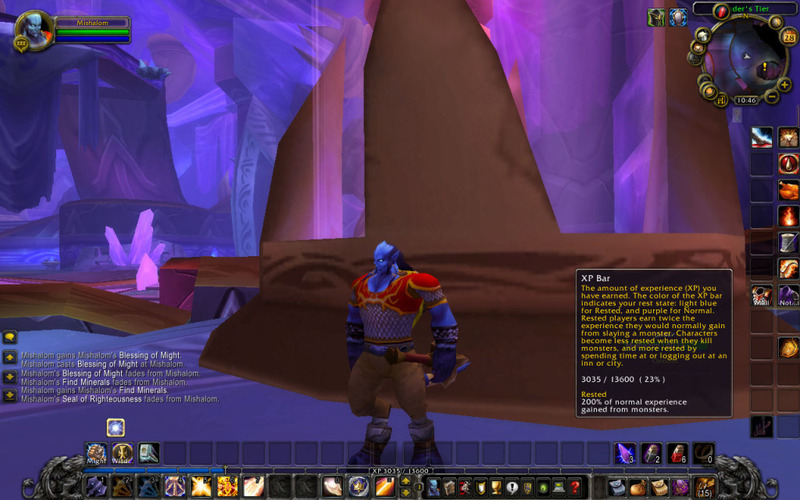 WoW has a notoriously confusing timeline, in the way that they don’t have a full official one and most of the timeline resources conflict each other (as I mentioned before, I based mine on the unofficial timeline). Add that to the fact that many of the races have different sources on their aging, and it makes it hard to decide how old, exactly, your character is. 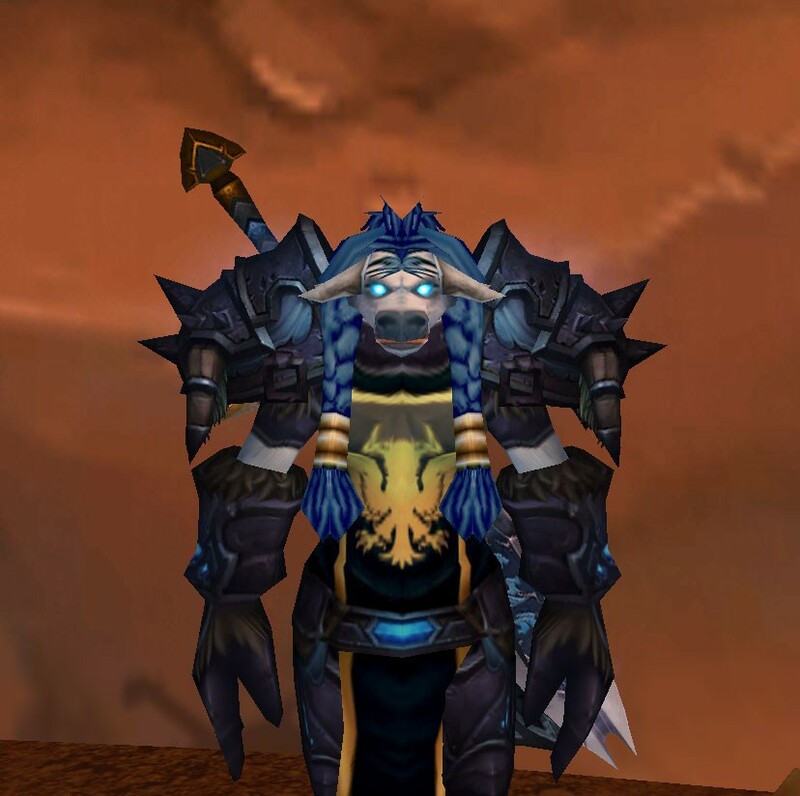 I was originally going to have her be even younger, age-wise (in her 40s), but she has two younger sisters (years younger, in fact) that both can be considered adults as well, so it makes sense to push her age higher (I even drew out a graph, mapping the human age of 25 to what the Tauren age would be, assuming that both Tauren and Humans become ‘adults’ at the ages 15 and 50 and are ‘middle-aged’ at 35 and 75, respectively. 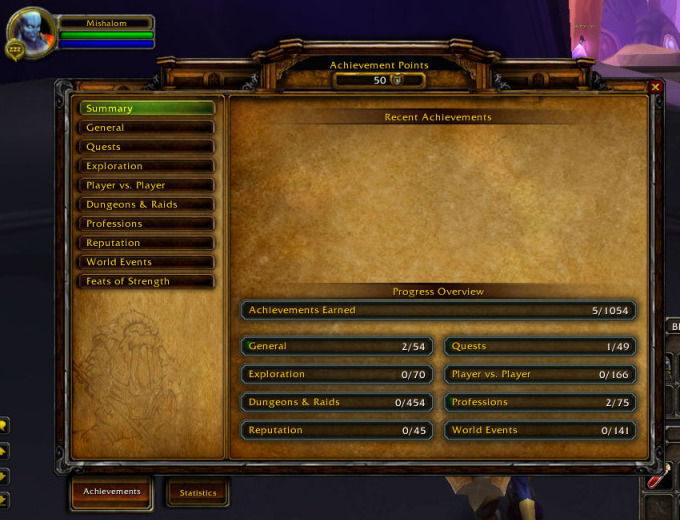 Those numbers are based off the life spans of races on wowwiki). In fact, I also made up a bit about Shaman. I’m unsure how controlling the elements allows one to heals others, or if shaman interact more with the ancestors and the Earthmother who can help with healing. I’m thinking it’s more of the latter, but I haven’t done my research. Also, Misha really hates being called a cow, or being told to moo. 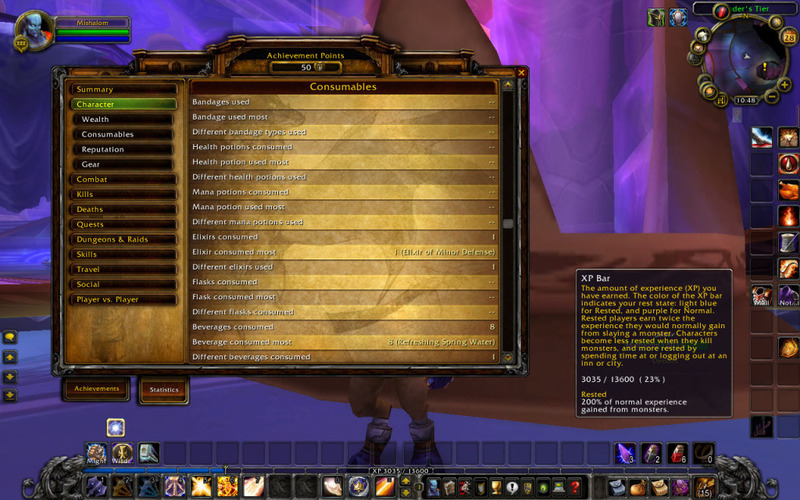 Stupid moo emote.